Thanksgiving. A day of the year to give thanks for all that we hold dear, including the harvest. It is the beginning of the holiday season. Enough. What is Thanksgiving really for? 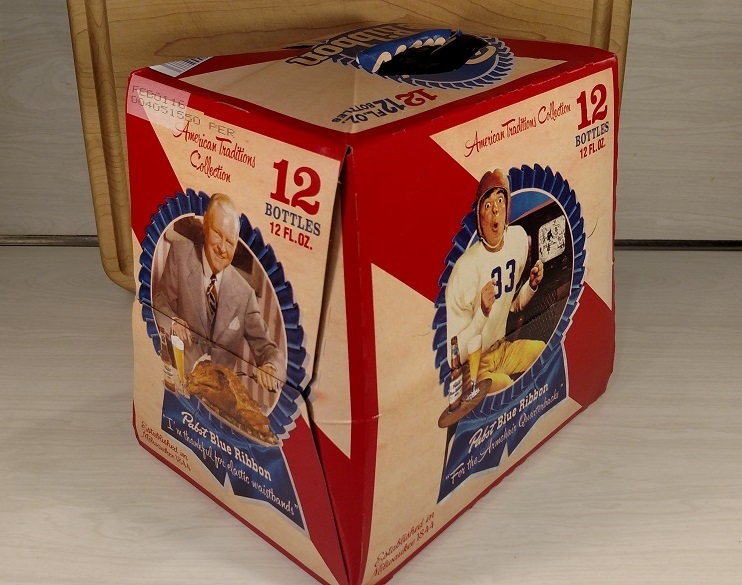 It is for eating food, watching football, and drinking beer! So naturally, it’s the Fewd Snobs’ favorite holiday!! 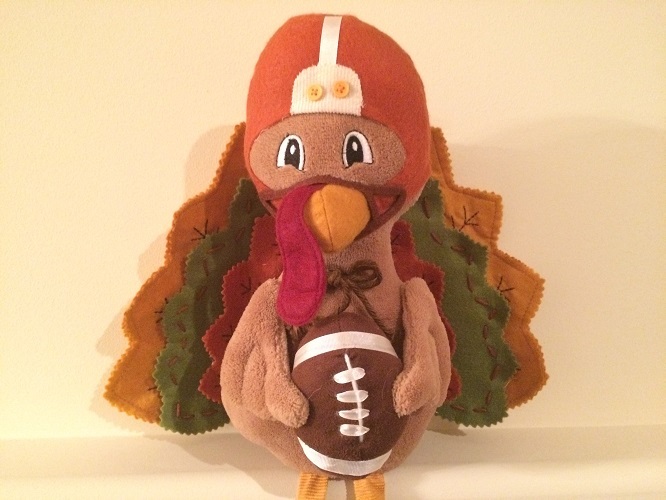 Our football turkey above agrees! The only thing he is missing is his beer! Yes, Denny and Herman both enjoy the holiday more than any other. If there was a holiday designed for Fewd Snobs, this is it. No gifts. No worries. Just food and beer and football. Perfect. 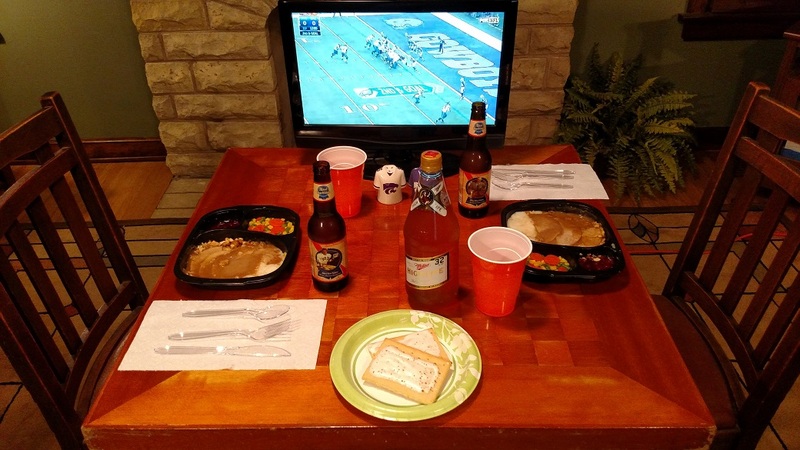 So, in planning our festivities, we decided that we would share with our readers what a Fewd Snobs Thanksgiving looks like! Remember what we are all about here, and this will make perfect sense. As you all know, we are the opposite of true “snobs.” So, what would our Thanksgiving look like? First of all, there is a LOT of work that goes into a Thanksgiving meal. You need turkey. That’s a given. A roasted turkey takes hours. Plus, there’s all that prep! If your bird is frozen, you need to thaw it. Then you have to find something to do with the guts. Yuck. Now, wash the bird. This is fun! Wait…no it isn’t. Now we have to season it, put butter all over it, and on and on and on. Now we wait. And wait. And baste. And wait. This is too much work. Then, we need to peel potatoes. Then boil them. Then mash them. 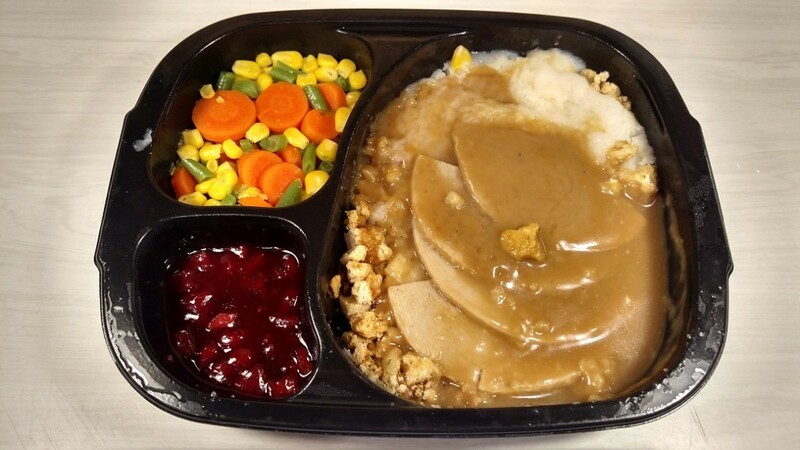 Then, do vegetables, sweet potatoes, open a can of cranberries, stuffing, and on and on and on (again!). Oh yeah, almost forgot…you need pies! Baking a pie! Oh my! What do we look like, Julia Chilld?? This is taking WAY too much time away from our beer and football! Yes, we solved our problem with a $2.50 Hungry Man meal! A couple of these, and the Fewd Snobs are ready for a feast! What’s not to love here, people? We have roasted carved white meat turkey, mashed potatoes, gravy, stuffing, mixed veggies, and an apple cranberry desert! What isn’t appetizing about this?? It’s perfect! That’s right, Snobs. In 9 minutes, we have Thanksgiving dinner!! Also for dessert, we needed some kind of pumpkin pie. Again, we’re not Julia Child here. And we’re not hosting a show on the Food Network, people. No Pioneer Woman here! But, we have a fix for this too! Remember our review of Pumpkin Pie Pop-Tarts?? Problem solved! Every Thanksgiving meal needs a drink pairing. So what are we to do here? This one is easy!! 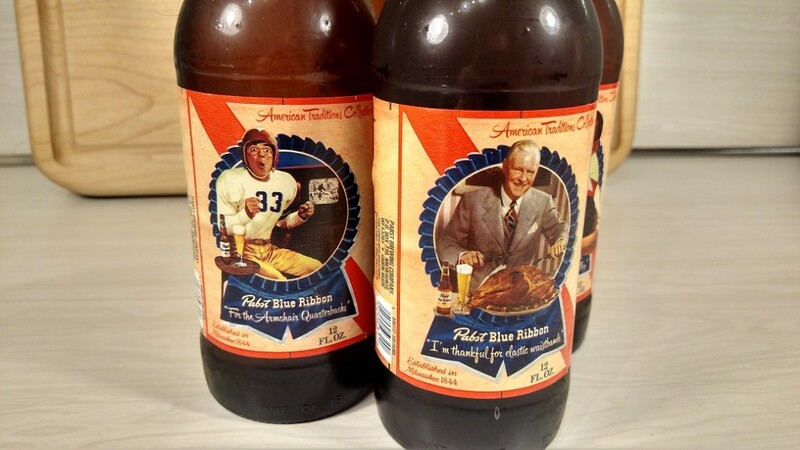 We found cool Thanksgiving-themed beer. Pabst Blue Ribbon! Yes, a couple of 32oz. 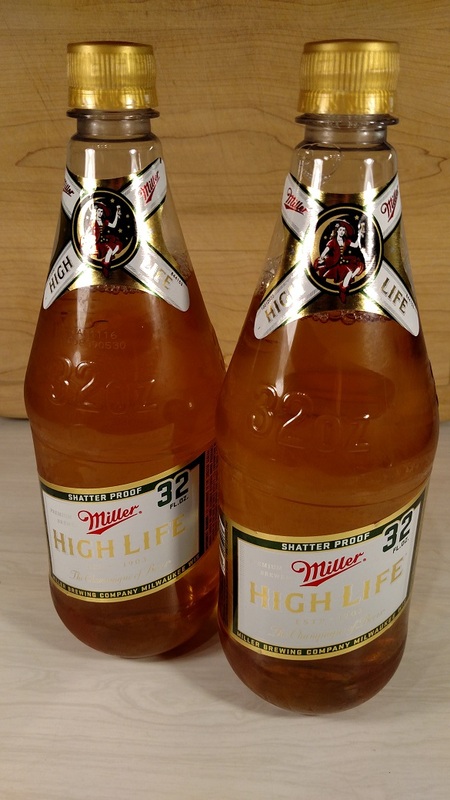 Miller High Lifes will do nicely! Gotta ice ’em first, though! Yes, you are seeing correctly. 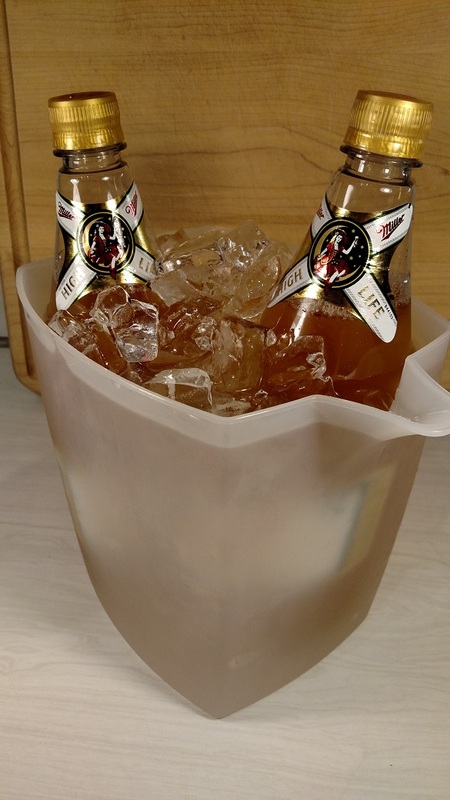 We have our big Miller High Lifes iced down in a pitcher! Now we are on to something! We have our food and drink solved. What is left? Feasting and watching the game! We “set” our table, and the Fewd Snobs’ Thanksgiving is complete!! There you have a Fewd Snobs’ Thanksgiving! Everything we need is right on our table. 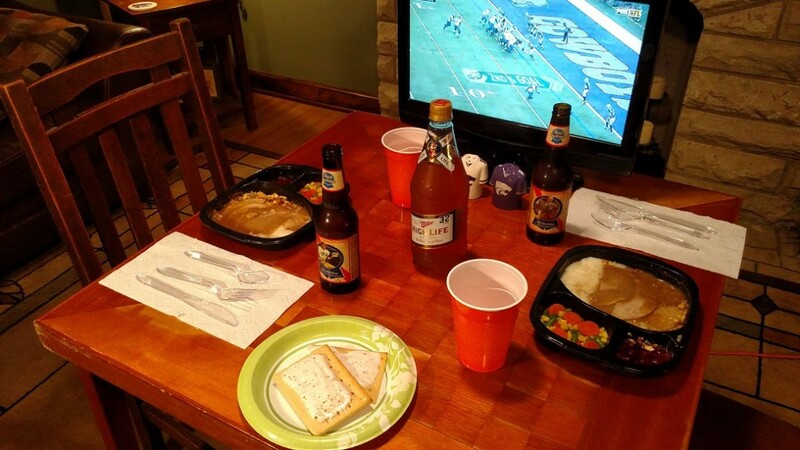 We have our dinner, our beers, our “champagne” for the toast in our orange “Thanksgiving cups,” our pumpkin pie Pop-Tarts for dessert, and our TV with the game on! Also, note our fancy paper towel “napkins” and our plastic silverware! We’re telling you, the Fewd Snobs went all out on this holiday! To top it all off, we have our Kansas State salt and pepper shakers! Overall, we enjoyed our feast! The meal and dessert were great, followed by plenty of PBR after our High Life toast! 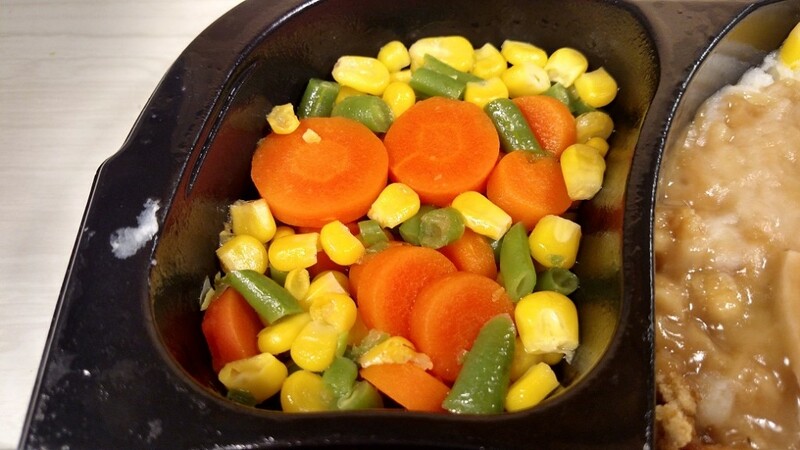 The best part…no dishes! It took us 2 minutes to clean up after this one, people! Quick Review: Although this isn’t a review, in the spirit of our site, we wanted to say just a little. The Hungry Man meal is 1 pound of food. And it really is. We actually DID eat our Thanksgiving meal, and we liked it! 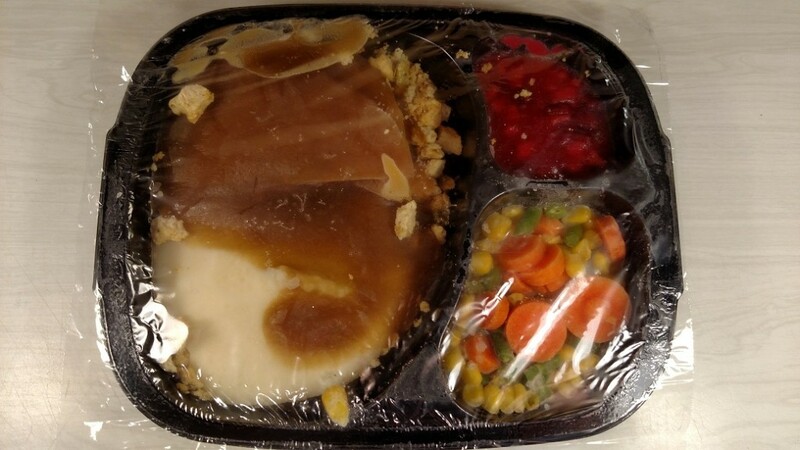 There were four pieces of turkey in the meal, and they were good! 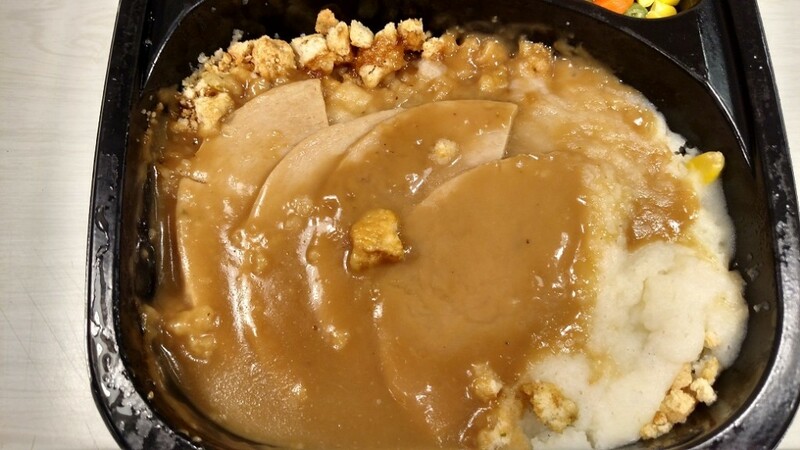 The mashed potatoes were fine for a frozen meal. The gravy topped it all off nicely. The veggies were even good! There is a nice buttery sauce on them. The Fewd Snobs way! Even the apple cranberry dessert has a nice taste and texture. The stuffing was fine, but it was a little chewy. We can’t complain too much, though. 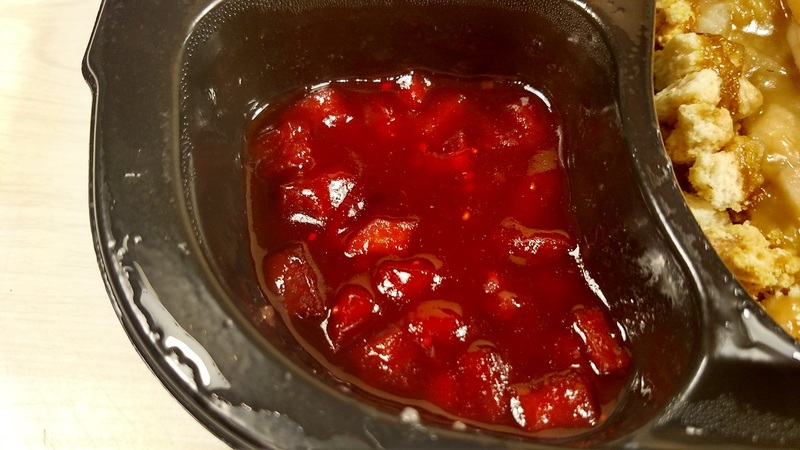 Overall, the meal has a good flavor. And you can’t beat it for $2.50. 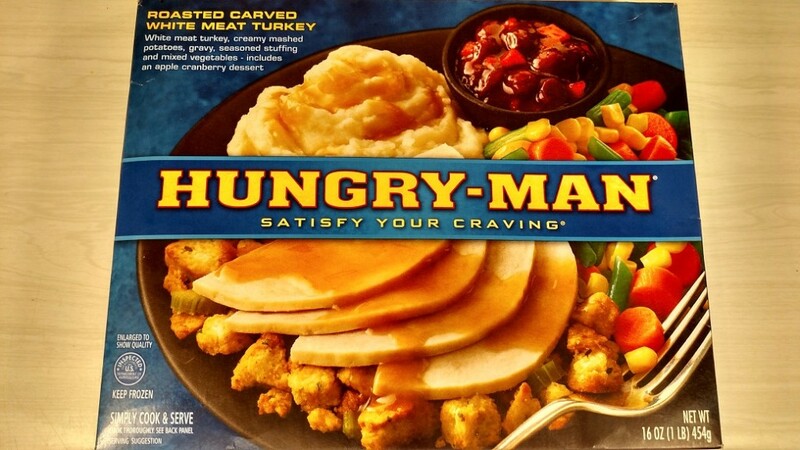 The Hungry Man meal would be great for lunch at an office, for example. We would like to stock up on about ten of them, and have them for drunk food! 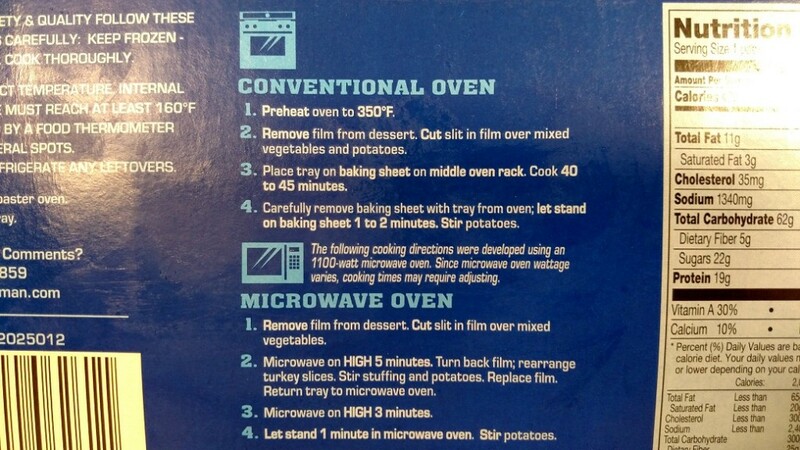 All you have to do is operate the microwave! Perfect! 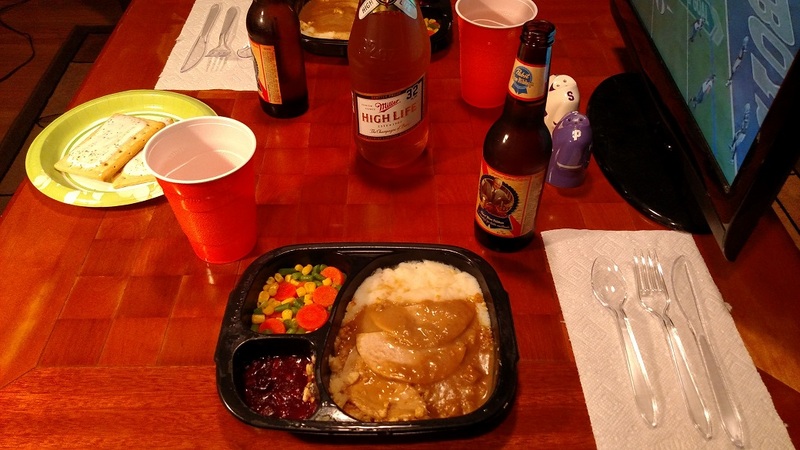 And there you have a Fewd Snobs’ Thanksgiving! As we wrap up our Fewd Snobs’ Thanksgiving, we want to tell you that Denny and Herman both actually have “normal” Thanksgiving with our families! It is truly a favorite holiday for us, and we enjoy being with our families and doing the big normal dinner! Denny’s family always does a huge 25 pound roasted bird topped off with his mom’s famous stuffing. Herman’s family changes up the turkey each year, but they usually do a roasted turkey and a smoked turkey. This year, his dad is deep frying a bird. His family also does a regular dressing and an oyster dressing. Herman also usually tends to set the kitchen on fire the night before while making pies! We just wanted you to know that the Fewd Snobs aren’t COMPLETE drunken slugs! But, we had to do a version of what our Thanksgiving would look like for you, too!! Denny and Herman wish you all a Happy Thanksgiving. We are thankful to all of you for visiting our site and making it successful in our first year. Thank you all, and have a great holiday! !